The competition will follow the official ﻿IRF rules﻿ (1), complimented by additional guidance from the organizers. The rules will be available for reading at the INFO board. B14. No caches. As an exception to official IRF rules, all caches are forbidden. This means you cannot leave packs, food or equipment temporarily unattenden (to pick up later) for even a short part of the course. Competitors must carry all their equipment for all of the time that they are on the course and away from the competition center (Also dictated by the rules of National Park). However, competitors are allowed to leave and pick up equipment as they require, from the competition center. The obligatory equipment must be carried at all times, though. the race sponsors must be visible. band aid and 2 meters of at least 2 cm wide sports tape. *** NOTE: The mobile phone must be turned off and put in sealable plastic bag (waterproofness not guaranteed) provided by the organizers. Mobile phone must be capable of calling to Finnish numbers and receiving SMS in the competition area (with network coverage). Please check your roaming details and note the GSM standard. a) The only navigational aids that may be carried on the course are magnetic compasses, watches and copies of the competition map. pedometers and altimeters on the course is prohibited. untampered will be disqualified unless it was accessed for emergency communications. d) The use of maps that provide additional information not shown on the competition map is prohibited for course planning and whilst on the course. B8. 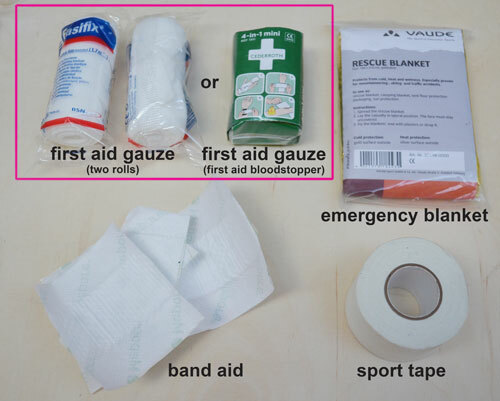 The use of aids for course planning, other than for distance measurement and scoring estimation, is prohibited. In particular, route optimization software or other sophisticated planning tools are not permitted. B12. A team shall not accept assistance from, nor collaborate with, other people during course planning or on the course, nor deliberately follow another team. How do rules B8 and B12 affect this event? All computers including smartphones and software/apps as well as the help of a support team are forbidden in route planning. How do rules B7 and B13 affect this event? Any otherwise prohibited device that provides no audible feedback (e.g. mobile phones and loggers) must be sealed in a bag, provided by the organizers. The unbroken seal must be presented to officials when arriving at the finish. A broken seal will incur the penalty stated in the rules. B10. All team members must stay together, i.e. shall remain within unaided verbal contact of one another at all times whilst on the course. A team shall demonstrate compliance with this requirement to any event official or other team on request. Regarding rule B17. (b) Team members must punch within 120 seconds at every control they wish to gain points from. If the time between the punching of the team members is more than 120 seconds no points from that control will be recorded. The activities of the teams are monitored during the event. B19. Competitors are not allowed to rest within 100 meters of controls. Competitors are not allowed to spoil or damage controls or any other structures built by the organizer. The following Jury members have been appointed and will be shown on the official INFO-board. The mobile phone mentioned in the equipment list is an obligatory piece of equipment and it is reserved for emergency use only. Mobile phones will be sealed by race officials before the start of the race and the sealed phones must be presented with the seal unbroken after finishing the race. The use of the phone during the race is strictly forbidden for any reason except emergencies. The mobile phone must be capable of operating in the Finnish mobile phone network. Competitors are liable to pay for all the costs caused by making the phone call. The phone network coverage is not 100% in the competition area. If you need to use the phone and you cannot get a connection, the best thing to do is to climb up to the closest peak and try again. Registration packs will be available for collection at the competition office on Friday between 12.00 – 22.00 and Saturday 6.00 – 9.00. - After race meal tickets, for use at Kiilopää Fjell center restaurant. As part of the registration process, competitors will need to show an identity document that contains their date of birth (e.g. a passport or identification card) The competition maps and control description sheets are handed out on Saturday at 9.00. A large part of the competition area is in Urho Kekkonen National Park. You can find more information on the Urho Kekkonen National Park webpage (5). All littering and leaving of trash or other material in the nature is strictly forbidden and can lead to disqualification. 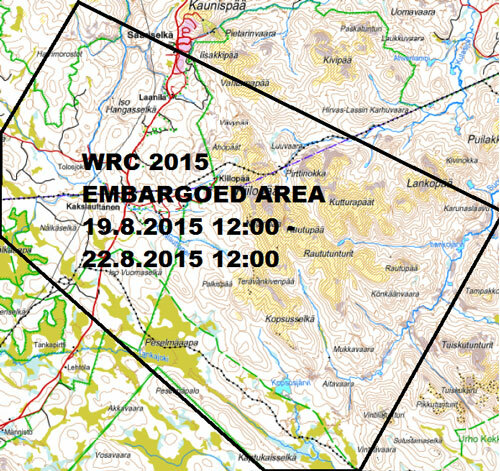 Moving around in the competition area is allowed until Wednesday 19 August 2015, at 12.00. After this time, until the race, the only permissible movement in the competition area is along the public roads (those drivable with normal car). The embargo (from 19 August 2015) does not include the training map area. Moving within training map's limits is not restricted and is open until the race starts. The training area is also in the National Park so the same Park rules apply and must be honored when moving around in the training area. A model map from the competition area will be published on the Competition Center Bulletin Board from Friday 21 August at 12:30, immediately after the opening ceremony. The competition map will be printed ON PAPER with a scale of 1: 40 000 and 5 m contours. Each 4th contour will be in bold (20 m), to make the map easier to read. The map is 70 x 50 cm and there will be clear plastic map bags in that size available when maps are collected. North-South grid lines point to magnetic North. Route planning is only allowed in the designated route planning area, see the Competition Center map. The area overlaps with the camping area and you can use your own tents in this area. The organizers reserve the right to control/enforce the restriction of not using computers, programs, mobile phones or apps for route planning by looking inside the tents. Competition maps must remain inside the route planning area until teams move to the race start. Only competitors with number bib visible are allowed to enter designated route planning area (see the map in this Bulletin) on Saturday 9.00-12.00. There are no shelters or tents provided by the organizers in the route planning area. Every team is responsible for their shelter, tents and other weather protection. Teams are also responsible for their own seating and tables, when in the course planning stage. Services in the Competition Center, outside this area can be used, but maps must be kept in the route planning area. Important: If you need a shelter for route planning or need to rent a tent for camping, please read Bulletin 4 (7), and act as quickly as possible. Organizers will provide each team with one sealable plastic bag with the team number on it. All electronic devices referred in clause B7 c) and compulsory mobile phones must be packed into this bag. Organizers will issue online GPS tracking for around 100 teams. Tracked teams are picked based on their earlier competition success and other organizer interests. GPS devices will be attached to a team's equipment by organizers. A team provided with an online GPS tracking device is responsible for the device during the race. The fee for a lost GPS unit is 400 €. The list of the selected teams will be published at the Competition Center Bulletin Board from Friday 21 August at 12:00. 12.00 Race information will be published at the Bulletin Board and on the web page. 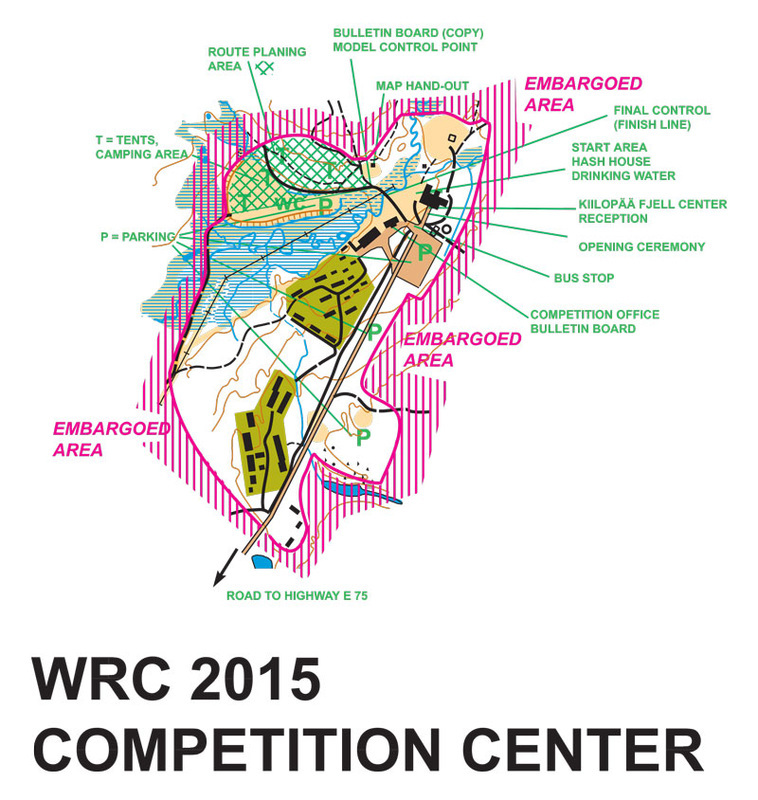 8.00 Final WRC race information will be published at the Bulletin Board (only)! We are organizing transportation between the competition centre at Kiilopää and the village of Saariselkä for the weekend. However, because there wasn’t a great amount of interest in transportation, the number of buses and trips had to be limited. The price will be 10€ for a round trip. The travel time between Saariselkä and the competition centre at Kiilopää is about 15 minutes. Anyone not accommodated at Kiilopää Hotel can purchase breakfast every morning during their stay at the area. Reserve your breakfast via our online shop (8) by Friday 14th August (12.00) at the latest. There is limited supply of breakfast available for others than hotel guests. Reserve in advance. Reserve your breakfast via our online shop (9) by Friday 14th August (12.00) at the latest. There is limited supply of breakfast available for others than hotel guests. Reserve in advance. During the competition, competitors can eat and drink at the Hash House tent. The Hash House is open from Saturday 15.00 until Sunday 12.30. The Hash House services is included in the participation fee. Competitors are advised to bring sports drinks and nutrition they are used to use during this kind of events, because local shops have limited variety. In the terrain, there is only water available. Competitors must therefore carry all other nutrition needs with them. Competitors or supporters are not allowed to sleep or camp at the Hash House tent. Food from the Hash House is supposed to be eaten in the Hash House. - if you have a life threatening food allergy, please use the form (10) to let us know. Use the spirit of Fair Play - may the best team win!